Just got lucky. I was able to watch the live performance in the middle of the very front row! Show was wonderful. It was a best selection from Ghost of Glaceland, Coup De Grace, Organized Crime and Dreamhunter albums. Each song was a highlight. 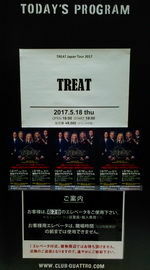 TREAT has such a bunch of good songs with impressive melody lines. Ringing introduction of Sole Survior really took me back. I haven't listened to Dreamhunter album for some 10 years, but I was able to sing along to each song performed on stage. Apparently I used to listen to that album hundreds of times. Inferno is one of my favirites from Ghost of Glaceland. Robert said that they haven't played it live until this Japan tour. That's so impressive. I had a very good time with all the fans at the place. Thank you, Anders, Robert, Jamie, Patrick and Pontus. I really hope to see you again.